15th Century — Not much is known, but actual wooden balls were thought to be used. Mid 1800s and Earlier — The “feathery cube” was the very first golf ball, a leather-covered ball stuffed with feathers of some kind (usually goose). The outside was generally covered with some type of resin or paint and was very expensive and labor-intensive to make. 1848 — The “gutty” or the “gutta percha” ball was introduced. Made from the gum of tree sap, it became hard after cooling. It was also much less expensive to produce. As it would often break up in the air, rulings allowed a player to play a fresh ball where the largest fragment landed. Late 19th Century — It was discovered that a pocked gutty flew truer than a smooth one, and dimples began to be purposely implemented in the balls. 1898-1901 — A rubber-cored ball made its first appearance when created by Coburn Haskell, in association with Bertram Work of the B.F. Goodrich Company. It was made of rubber thread wound around a solid rubber core. There were many deviations in size and weight. Early 1900s — A Balata cover is introduced, and more of a standard dimple-pattern started surfacing. 1932 — Standardizations of golf ball weight and size are established by the United States Golf Association. 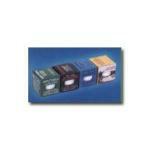 Varied developments of plastics, silicones, and improved rubber elements are introduced. Beginners — Cheap, my friend, cheap. At this stage, none of us can really tell the differences of a golf ball other than the fact that we tend to lose a lot of balls. Why spend too much on a fancy ball that feels the same to us when we skull one into the lake? In addition, it is best to choose a ball that boasts distance to help us extend some of our shots, and to choose a ball that doesn’t “cut” easily — for longevity. 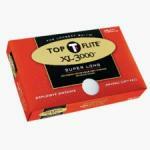 One suggestion is the Top Flite Super Long Distance XL3000. Intermediate — As you play more and see scores drop, it is time to find a ball that more fits in with your particular style and game specifics. One thing to start looking for is not just distance and durability, but how the ball can be more controlled around the green. 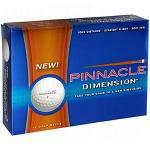 Look for a nice, two-piece “low compression” ball such as the Maxfli Noodle or the Nike Power Distance. Low Handicapper — Alright, hot shot. Time to really start using a ball for control. You get low scores and really like to show off a little when you stick that second shot about three feet from the pin. 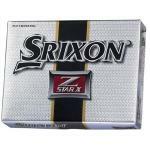 You do pretty well on contests and want your ball to reflect a little of your ability. You start to go with a “multilayer construction” ball and choose types like the Pro V1 or the Nike One Tour. Fancy. You’ll also need to start really paying attention when your ball ends up next to someone else’s. They’re likely to “switch” with you. Alec Baldwin said it best, "You are not going to be able to resist my Schwetty Balls!" These golf balls obviously are inspired by the hilarious Saturday Night Live skit where Alec plays a guest on a public radio show. 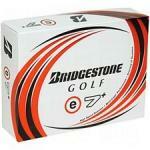 You're looking at the Bridgestone E7+. This ball has been out for a while and has since been replaced with the new Bridgestone E7, but I'm partial to the E7+. And I'll tell you why. 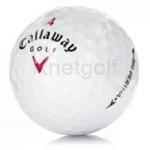 This is Bridgestone's E5 golf ball. It is designed for you golfers looking for a higher ball flight. Let's take a closer look. This is Bridgestone's E5+ golf ball. It is designed for you golfers looking for a higher ball flight with a very soft feel and a lot of spin around the greens. Let's take a closer look. This is a new twist on the B330-RX. The concept behind these two golf balls (the Tour B330-RXS and the B330RX) is they are a tour-quality golf ball designed for amateurs without the tour-quality swings. 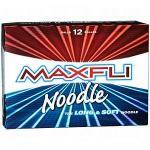 These Noodle Long & Soft balls are extremely popular -- and for good reason. 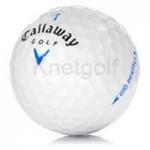 The ball is a game-improving golf ball with a soft feel and a low spin to dampen some of that slice (or hook) spin and fly straight to your target. "You likka da Juice, ay?? Da Juice is good, ay?" This is a reference to an old Saturday Night Live skit (not a congressional hearing with Mark McGuire). The brilliant marketers at Nike are playing to your conscious with this Karma ball. 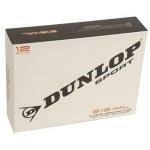 In fact, the packaging of these golf balls is made with 50% recyclable material. With most of us golfers being a superstitious lot, it is brilliant. Simply BRILLIANT! These Birdie Balls only go 40 yards max. Thus, you can practice in your backyard. This is every man's ball, the quintessential golf ball. This is the Big Mac, the Coca-Cola, and the Budweiser. I probably find more Top Flite balls when I'm looking for lost balls on the course than any other golf ball. This golf ball has more layers than a German Chocolate cake… five to be exact. Hence the "penta" in Penta TP. The idea was to create a ball that will benefit every swing speed. 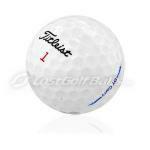 This is the ball that Tiger Woods plays. Obviously it's Nike's premium Tour Ball. Let's take a look at the construction. 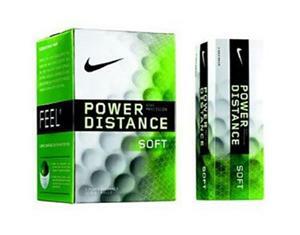 This is Nike's Tour distance ball. 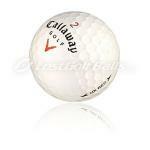 This is the brother of the Nike Tour ball, only it goes further with less spin off of the tee. Let's take a look at the construction. I always keep some of these plastic wiffle golf balls in my bag. They can come in handy and make a great practice tool. It's golf gadget time. Here's an interesting concept for two hundred and fifty schmolies. But rest assured, this is going to pay for itself in lost golf balls. It's a radar detector for your balls. The first time is saw one of these, I didn't realize it was a decal. 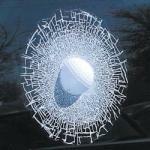 I thought, "Wow, that's really cool that somebody loves golf so much, he'd drive a golf ball into his car window and just leave it there." Golfers consist of all shapes, sizes, abilities, and swing speeds. 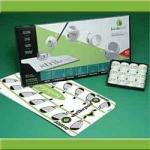 Whatever your ability, you should employ the best technology to get the most out of your game. That means using the correct driver, the right woods, the irons, the putter – right down to the golf ball. We all are familiar with perimeter weighted golf clubs, but have you guys heard of a perimeter weighted golf ball? I submit to you Callaway's Tour i! "Boom Boom" Freddy Couples is the Bridgestone man. I'm pretty sure he doesn't play these particular E6+ golf balls, but Lee Trevino might. And I'm betting you should. 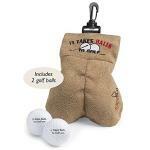 Well looky here… You've reached the top of the food chain of amateur golf balls. If you are looking at spending $40 on a golf ball, I'm going to assume you've got a pretty good golf swing and knowledge about golf balls, so let's cut to the chase.